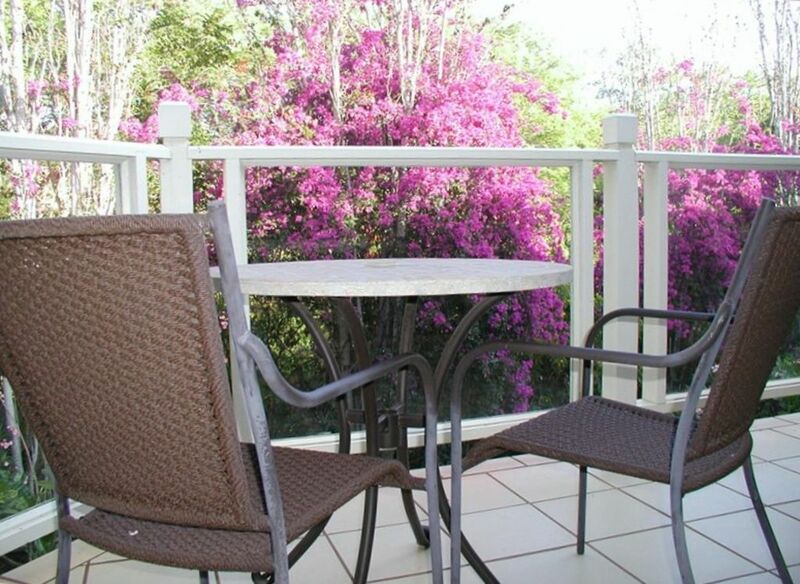 This studio offers private lanai and kitchenette with sink, full size fridge and microwave. King size bed, and remodeled bathroom with walk-in shower. This is a corner unit and is quiet with no roads nearby. * Ideal for those who want to have breakfast and/or lunch at home, there are also gas BBQs available by the pool, just a short walk from your front door. Tree Top Studio is a 400 sq foot Suite with cathedral ceilings, ceiling fan and air conditioning. It features teak and bamboo unique vintage style furnishings with a new king, pillowtop bed, comfy sofa, tv w/dvd player, cd/radio/stereo, dining for 2 inside and out. The corner unit offers privacy with 'tree top' views. The sunny, tiled lanai looks onto a greenbelt of flowering tropical trees and plants filled with birds. Spacious bath features tiled, glassblock, walk-in shower with pebblestone floor and 2 shower heads. The 'kitchenette' has a full size fridge/freezer, microwave, toaster, coffee maker, blender and kitchen sink. Dishes and silverware are provided. The nearby pools offer gas bbq's. This is the perfect, affordable accommodation for those who do not wish to do a lot of cooking. Have breakfast in, keep your Maui blanc chilled, have ice and a blender for your mai tais, the gas grills nearby can sear your ahi and you can dine under the stars on your lanai. Wailea and Kihei have many restaurants to choose from. Free wi-fi, free parking (unassigned) Walking distance to Wailea Tennis Club, Shops of Wailea, numerous restaurants, Sunset cocktails and the extraordinary Wailea Oceanfront Trail. 2 minute drive to famous Ulua beach....more beautiful beaches than you can count within 5 minute drive! I grew up in Canada and now living in the San Francisco bay area. I'm an avid golfer and foodie, so Wailea is the perfect place for me! My first snorkeling experience was at Ulua beach, it was so memorable that every time I came to Maui I wanted to stay close by. Wailea has it all great restaurants, beaches and golf courses all within a short drive. We stayed in early January for ten days, and loved it. It is not only well situated and had everything we needed, but the balcony overlooking the trees was such a relaxing oasis. We were so glad we chose this place for our holiday, and wouldn’t hesitate to come again. Thank you! The studio was well equipt and comfortably appointed for two adults and we would recommend it for an enjoyable stay . The cable system went out but was quickly taken care of by Chris , the local trouble call contact before we returned from the beach that day . The view from the lanai was relaxing and became a perfect breakfast setting before starting our daily adventures . The condo was nice for our stay but there are couple of things; the carpet needs to cleaned and replace the towels. The purple and green towels had a bad odor to them and after washing them a couple of times that didn't help. Some of the other towels weren't as bad. The beach towels didn't have an odor. There is a bump between the tile and the carpet that is not smooth, so maybe that could smoothed out. The bed was comfortable and the patio was enjoyable. Thank you for your feedback. We will change out the towels you mentioned. The carpet is professionally cleaned frequently, with guest beach activities we do our best in between. The property mangers can be contacted at anytime to change out towels or anything else that seems not right. The unit was very nice and efficient. Every thing you need is in the unit with plenty of information. Towels, beach chairs, snorkeling gear, water noodles, boogie board, ice chest and more.... clean and comfortsble. Internet. Convenient location to restaurants, shops in Kihei, golfing, walk to Roy’s and pathways to public beaches and shopping. This was probably the best experience I have had with VRBO. Anne was super quick with her responses. The condo was absolutely perfect. Location is amazing, I could walk to many restaurants and to the Grand Wailea where some of my family was staying. There is not a thing I would add to the Treetop, I can’t believe how efficient the kitchen is, it has everything! Plus all the beach equipment you need (good quality, too, not rusted like others I have stayed at). The best part was waking up every morning to the beautiful fauna and the birds. Ditto when they tucked themselves in for the night! Paradise on the lanai!